Wilton Engineering has received a Board of Trade Award from the Department of International Trade. The Middlesbrough-based company is one of a small number of organisations from the Northern Powerhouse region of England to be presented with the 2019 award that celebrates businesses that bring innovation and prosperity to the UK. Announced by the Secretary of State, Liam Fox, the Board of Trade awards recognise companies that have made an outstanding contribution to international trade. The company has undertaken a diverse portfolio of successfully-delivered projects, predominately for the oil and gas and offshore renewables sectors, which includes a number of significant export contracts. Among them was the recent completion of the production of 21, 340-tonne offshore wind turbines transition pieces, through its client SteelWind, for Ørsted’s Hornsea Project One offshore wind farm. The firm’s chief executive, Bill Scott OBE, said: “We are very pleased to be recognised by the Department of International Trade for the work we do in the energy sector. 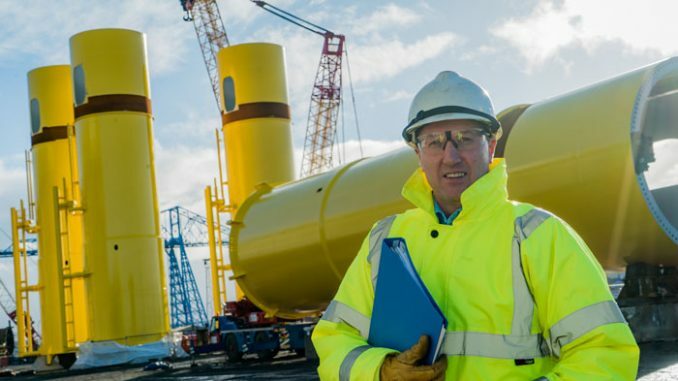 “The UK energy supply chain, of which Wilton is proud to be part of, is highly-regarded by international industry and has been integral to delivering innovative solutions and engineering excellence that has supported operations in the offshore sectors.